Rebirth in Buddhism refers to its teaching that the actions of a person lead to a new existence after death, in endless cycles called saṃsāra. This cycle is considered to be dhukkha, unsatisfactory and painful. The cycle stops only if liberation is achieved by insight and the extinquishing of desire. 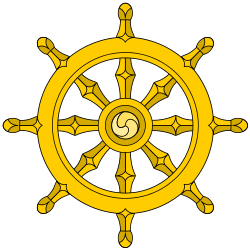 Rebirth is one of the foundational doctrines of Buddhism, along with Karma, nirvana and moksha. Rebirth is discussed in Buddhist scriptures with various terms, such as Āgati-gati, Punarbhava and others. The term Āgati literally means 'coming back, return', while Gati means 'going away' and Punarbhava means 're-becoming'. Āgati-gati in the sense of rebirth and re-death appears in many places in early Buddhist texts, such as in Samyutta Nikaya III.53, Jataka II.172, Digha Nikaya I. 162, Anguttara III.54-74 and Petavatthu II.9. Punarbhava in the sense of rebirth, similarly appears in many places, such as in Digha II.15, Samyutta I.133 and 4.201, Itivuttaka 62, Sutta-nipata 162, 273, 502, 514 and 733. Numerous other terms for rebirths are found in the Buddhist scriptures , such as Punagamana, Punavasa, Punanivattati, Abhinibbatti, and words with roots of *jati, *rupa. While all Buddhist traditions accept some notion of rebirth, they differ in their theories about rebirth mechanism and precisely how events unfold after the moment of death. The early Buddhist texts suggest that Buddha faced a difficulty in explaining what is reborn and how rebirth occurs, after he innovated the concept that there is "no self" (Anatta). The texts also suggest that the Anicca theory led to difficulties in explaining that there is a permanent consciousness that moves from life to life. Later Buddhist scholars such as Buddhaghosa suggested that the lack of a self or soul does not mean lack of continuity; and the rebirth across different realms of birth – such as heavenly, human, animal, hellish and others – occurs in the same way that a flame is transferred from one candle to another. The Pudgalavada school of early Buddhism accepted the core premise of Buddhism that there is no attā (ātman, soul, self), but asserted that there is a "personal entity" (pudgala, puggala) that retains karma balance sheet and is mechanistically involved in rebirth; this personal entity, stated Pudgalavada Buddhists, is neither different nor identical to the five aggregates (skandhas). This concept of personal entity to explain rebirth by Pudgalavada Buddhists was polemically attacked by Theravada Buddhists in early 1st millennium CE. The personal entity concept was rejected by the mid-1st millennium CE Pali scholar Buddhaghosa, who attempted to explain rebirth mechanism with "rebirth-linking consciousness" (patisandhi). ↑ This is discussed in many Suttas of different Nikayas. See, for example, Devaduta Sutta in Majjhima Nikaya (iii.178). ↑ Jainism posits that there are four realms, in contrast to six of Buddhism; the Jaina realms are heavenly deities, human, non-human living beings (animal, plants), and hellish beings. Within the human realms, Jainism asserts that rebirth lineage and gender depends on karma in the past lives. 1 2 3 4 5 Peter Harvey (2012). An Introduction to Buddhism: Teachings, History and Practices. Cambridge University Press. pp. 32–33, 38–39, 46–49. ISBN 978-0-521-85942-4. 1 2 3 4 5 Norman C. McClelland (2010). Encyclopedia of Reincarnation and Karma. McFarland. pp. 226–228. ISBN 978-0-7864-5675-8. 1 2 3 4 5 6 7 8 9 10 11 12 13 14 15 16 17 Robert E. Buswell Jr.; Donald S. Lopez Jr. (2013). The Princeton Dictionary of Buddhism. Princeton University Press. pp. 708–709. ISBN 978-1-4008-4805-8. ↑ Edward Craig (1998). Routledge Encyclopedia of Philosophy. Routledge. p. 402. ISBN 978-0-415-18715-2. ↑ Obeyesekere, Gananath (2005). Karma and Rebirth: A Cross Cultural Study. Motilal Banarsidass. p. 127. ISBN 978-8120826090. ↑ Nanamoli Bodhi (2005). The Middle Length Discourses of the Buddha: A Translation of the Majjhima Nikaya. Simon Schuster. pp. 1029–1038. ISBN 978-0-86171-982-2. 1 2 3 William H. Swatos; Peter Kivisto (1998). Encyclopedia of Religion and Society. Rowman Altamira. p. 66. ISBN 978-0-7619-8956-1. 1 2 3 4 5 Ronald Wesley Neufeldt (1986). Karma and Rebirth: Post Classical Developments. State University of New York Press. pp. 123–131. ISBN 978-0-87395-990-2. 1 2 Wendy Doniger (1999). Merriam-Webster's Encyclopedia of World Religions. Merriam-Webster. p. 148. ISBN 978-0-87779-044-0. 1 2 3 Williams 2002, pp. 74-75. ↑ Buswell & Lopez 2003, pp. 49-50. ↑ Harvey 2013, pp. 71-73. ↑ Kalupahana 1992, pp. 38-43, 138-140. 1 2 Buswell & Lopez 2003, p. 708. ↑ Arvind Sharma's review of Hajime Nakamura's A History of Early Vedanta Philosophy, Philosophy East and West, Vol. 37, No. 3 (Jul., 1987), page 330. ↑ Keown 2000, p. 32. ↑ Anderson 1999, pp. 1-48. 1 2 3 4 Thomas William Rhys Davids; William Stede (1921). Pali-English Dictionary. Motilal Banarsidass. pp. 94–95, 281–282, 294–295, 467, 499. ISBN 978-81-208-1144-7. ↑ Peter Harvey (2013). The Selfless Mind: Personality, Consciousness and Nirvana in Early Buddhism. Routledge. pp. 95–97. ISBN 978-1-136-78329-6. 1 2 David J. Kalupahana (1975). Causality: The Central Philosophy of Buddhism. University Press of Hawaii. pp. 115–119. ISBN 978-0-8248-0298-1. 1 2 3 James McDermott (1980). Wendy Doniger, ed. Karma and Rebirth in Classical Indian Traditions. University of California Press. pp. 168–170. ISBN 978-0-520-03923-0. ↑ Buswell & Lopez 2003, pp. 49-50, 708-709. ↑ Karma-gliṅ-pa; Chogyam Trungpa; Francesca Fremantle (2000). The Tibetan Book of the Dead: The Great Liberation Through Hearing in the Bardo. Shambhala Publications. pp. 4–23. ISBN 978-1-57062-747-7. ↑ Kevin Trainor (2004). Buddhism: The Illustrated Guide. Oxford University Press. pp. 210–211. ISBN 978-0-19-517398-7. ↑ Peter Harvey (2012). An Introduction to Buddhism: Teachings, History and Practices. Cambridge University Press. pp. 71–75. ISBN 978-0-521-85942-4. ↑ Bruce M. Sullivan (1997). Historical Dictionary of Hinduism. Scarecrow. pp. 235–236 (See: Upanishads). ISBN 978-0-8108-3327-2. ↑ Klaus K. Klostermaier (2007). A Survey of Hinduism: Third Edition. State University of New York Press. pp. 119–122, 162–180, 194–195. ISBN 978-0-7914-7082-4. ↑ Kalupahana 1992, pp. 38-39. ↑ G Obeyesekere (1980). Wendy Doniger, ed. Karma and Rebirth in Classical Indian Traditions. University of California Press. pp. 137–141. ISBN 978-0-520-03923-0. ↑ Libby Ahluwalia (2008). Understanding Philosophy of Religion. Folens. pp. 243–249. ISBN 978-1-85008-274-3. ↑ Harold Coward; Julius Lipner; Katherine K. Young (1989). Hindu Ethics. State University of New York Press. pp. 85–94. ISBN 978-0-88706-764-8. 1 2 Naomi Appleton (2014). Narrating Karma and Rebirth: Buddhist and Jain Multi-Life Stories. Cambridge University Press. pp. 76–89. ISBN 978-1-139-91640-0. ↑ Kristi L. Wiley (2004). Historical Dictionary of Jainism. Scarecrow. p. 91. ISBN 978-0-8108-5051-4. ↑ Kristi L. Wiley (2004). Historical Dictionary of Jainism. Scarecrow. pp. 10–12, 111–112, 119. ISBN 978-0-8108-5051-4. ↑ Gananath Obeyesekere (2006). Karma and Rebirth: A Cross Cultural Study. Motilal Banarsidass. pp. 107–108. ISBN 978-81-208-2609-0. ↑ Kristi L. Wiley (2004). Historical Dictionary of Jainism. Scarecrow. pp. 118–119. ISBN 978-0-8108-5051-4. ↑ Naomi Appleton (2014). Narrating Karma and Rebirth: Buddhist and Jain Multi-Life Stories. Cambridge University Press. pp. 20–59. ISBN 978-1-107-03393-1. 1 2 John E. Cort (2001). Jains in the World: Religious Values and Ideology in India. Oxford University Press. pp. 16–21. ISBN 978-0-19-803037-9. ↑ Kristi L. Wiley (2004). Historical Dictionary of Jainism. Scarecrow. pp. 10–12, 21, 23–24, 74, 208. ISBN 978-0-8108-5051-4.